Vadim Morozov, MD, FACOG, FACS, is a leader in the field of gynecologic surgery who specializes in the management of chronic pelvic pain (CPP), endometriosis, and minimally invasive gynecologic surgery (MIGS). He is a referral provider for Chronic Pelvic Pain (CPP) and endometriosis for the tri-state DC area of Maryland, Delaware, and Virginia. Additionally, he is currently Vice President of Product Development for SurgiGyn Inc., a company that creates and manufactures laparoscopic minimally invasive surgical tools and devices for use in gynecological surgery, which he co-founded. Previously, he has served as Program Director for the Center of Excellence in Minimally Invasive Gynecology (COEMIG) at the University Maryland Medical Center and Chair of Robotic Surgery at the University of Maryland Baltimore-Washington Medical Center. Dr. Morozov is a Fellow of the American College of Surgeons (ACS), the American College of Obstetricians and Gynecologists (ACOG), the American Academy of Gynecologic Laparoscopists (AAGL), the American Society for Reproductive Medicine (ASRM), and the Society of Reproductive Surgeons (SRS). He is also a member of the European Society of Human Reproduction and Embryology (ESHRE) and the Society of Laparoendoscopic Surgeons (SLS). Dr. Morozov began his medical education in the USSR, Belarus in Vitebsk Medical Institute. He then arrived in the United States and began a second medical education. He received a Bachelor’s Degree from Lehman College CUNY and a Doctor of Medicine from the SUNY Upstate Medical University College of Medicine before completing a residency in obstetrics and gynecology at the Long Island Jewish (LIJ) Medical Center affiliated with the Albert Einstein College of Medicine of Yeshiva University. He then completed an American Academy of Gynecologic Laparoscopists (AAGL) certified fellowship in gynecologic endoscopy and minimally invasive gynecology at the Nezhat Medical Center in the Atlanta Center for Special Pelvic Surgery and Reproductive Medicine. His clinical interests include chronic pelvic pain, endometriosis, fibroids, ovarian cysts, abnormal uterine bleeding, and pelvic adhesive disease. 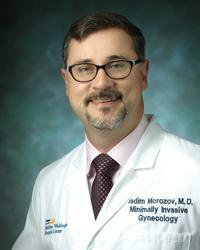 Dr. Morozov has dedicated much of his practice and many years to treating endometriosis, which he hopes to continue while at MedStar Washington. In order to provide the most novel techniques in treating endometriosis and chronic pelvic pain, Dr. Morozov performs a multitude of laparoscopic procedures, including laparoscopic presacral neurectomy for endometriosis and central dysmenorrhea/pain. Dr. Morozov is passionate about improving the landscape of gynecologic surgery through design, development, patenting, and marketing of new devices for minimally invasive gynecological surgery. As an avid innovator, Dr. Morozov invented the uterine excision device (UED), an electrosurgical element to the uterine manipulator for total laparoscopic hysterectomy; hybrid surgical mesh for the treatment of pelvic organ prolapse; and a pelvic device for control of hemorrhage during pelvic surgery. In 2013, he received the Super Doctors® Rising Star award for the tri-state of Washington, DC, Baltimore, and Northern Virginia. Dr. Morozov is widely published and has spoken on numerous occasions both nationally and internationally. He actively participates in the continued education of physicians and fellows and is a strong influence in the advancement of gynecologic minimally invasive surgery. He is passionate about growing MedStar Washington Hospital Center as a high-volume center for patients in the Washington, DC area to receive laparoscopic treatment of endometriosis, uterine fibroids, and hysteroscopic surgery. “I have completed two formal medical educations, firstly in Russia based on Eastern philosophy and secondly in the United States based on Western philosophy, which have provided me two different perspectives towards medical care. In my practice, the patient always comes first. My educational background contributes to my current philosophy of multidisciplinary care and the need for a selected team of specialists, including the patient and her family, in order to achieve the best results.